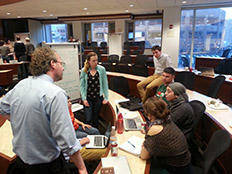 Jorrit de Jong, lecturer in public policy, listens to a student group work through an issue. Cities and towns across America face myriad challenges — from crime and criminal justice policy to educational and transportation infrastructure — but perhaps none as visible and visceral as so-called “problem properties.” Boarded up houses and fenced up vacant lots represent urban blight, deflating property values and spawning a number of health and security concerns. Even small to mid-size cities are experiencing this reality as the economy struggles to recover from the Great Recession. The problem of poorly-maintained properties is exacerbated by city governments encumbered by bureaucratic silos, which are simultaneously struggling with decreasing public revenues. But the Massachusetts towns of Chelsea, Fitchburg and Lawrence are re-engaged in the challenge with support from Harvard Kennedy School (HKS) student teams deployed through the Innovation Field Lab spring module. Co-taught by Jorrit de Jong, lecturer in public policy, and Joe Curtatone, Innovations in American Government Fellow at the Ash Center for Democratic Governance and Innovation and the mayor of Somerville, the seven week module offers students the opportunity to do real work on real problems in real settings and to learn firsthand about the practice of public sector innovation. Administrator of the Management, Leadership, and Decision Sciences Area at the Harvard Kennedy School.